NIGHTMARE ON ELM STREET'S DINNER TABLE. The Natural Solutions Foundation, the leading Global Health Freedom organization, is proud to present this information to you. We protect your right to know about – and to use – natural ways to maintain and regain your health, no matter where in the world you live. Among your freedoms is the right to clean, unadulterated food free of genetic manipulation, pesticides, heavy metals or other contaminants and access to herbs, supplements, frequency devices and other means as therapies that may benefit or to protect your well-being without drugs and other dangerous interventions, if you choose. For more information on our global programs, including the International Decade of Nutrition, and our US based ones, please visit us at www.HealthFreedomUSA.org and www.GlobalHealthFreedom.org and join the free email list for the Health Freedom eAlerts to keep you in the loop, informed and active defending your right to make your own decisions about your health and wellbeing! Our activities are supported 100% by your tax deductible donations. Please give generously (http://drrimatruthreports.com/index.php?page_id=189) to the Natural Solutions Foundation. Thank you for your support. Nightmare on Elm Street's Dinner Table. Thank you, Monsanto! Just in case you thought it was fine to eat Genetically Modified foods (better identified as "FrankenFoods"), along comes a study which makes it clear that you are eating this make believe non-food at your own peril and, worse yet, you are feeding it to your kids at their peril as well. It is important to note that Codex Alimentarius, which sets standards for the international trade of food, permits genetically modified foods and makes no effort to limit, control or eliminate them. In fact, the US has been trying for years to prevent the labeling of GM foods and seed in international trade to emulate its domestic policy which prohibits any label indication that foods contain GM ingredients, as 75-80% of all foods sold in the US do. Now it appears that the increasingly prevalent nightmare of a disease called "Morgellon's Disease" may be a result of GM crops and food. Morgellon's Disease was first described when a woman's 3 year old son developed rashes and intensely itchy sores which produced weird multicolor fibers emerging from his skin. She put up a website about the condition in 2001 and named it "Morgellons Disease" after a 17th century report of a similar affliction. As it always does, the allopathic community of Western, drug-oriented physicians labeled sufferers as delusional. As a physician, I have a great deal of difficulty explaining how a delusion can produce colored fibers which protrude from the skin and continue to grow in a petri dish. Be that as it may, the multicolored fibers produced by the "delusion" have been analyzed and we now know that Morgellon's Disease is no longer rare, nor is it mysterious any longer. 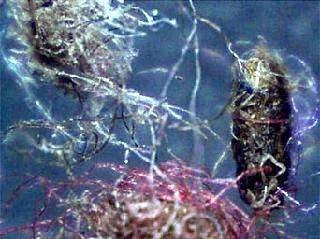 A study of the fibers shows that they contain DNA from both a fungus and a bacterium which are used in the commercial preparation of genetically modified foods and non-food crops (such as cotton). The fibers themselves are primarily cellulose, which the human body cannot breakdown or manufacture. So GM technology apparently has, like Professor Frankenstein, found a way to animate the non living. These fibers twist and twine, grow and divide. In short, living beneath the skin of people, they form parasitic lesions out of what should be non-living material but which, through the horror of genetic modification, has taken on the characteristics of a living thing. These pictures show fibers removed from lesions on the skin of Morgellon's Disease sufferers. No picture, however, can show you the insects crawling under my skin day and night torment of the victims. Frighteningly, some researchers say that every person they have tested has some level of Morgellon's type pathology in their skin. Since the Clinton administration made biotechnology â€œa strategic priority for U.S. government backingâ€ (1), giant transnational agri-business concerns have aggressively taken over the global food chain by flooding it with Genetically Modified Organisms (GMO) without regard for the consequences to the earth or its inhabitants. This takeover not only has the potential for global economic devastation, but threatens the earthâ€™s population with far-reaching health concerns as well. One health concern that seems to coincide with the GMO revolution is Morgellons disease. What if the advent of Morgellons disease has something to do with the ingestion of GMO foods? Morgellons Disease â€" What is it? "If I fully tell people what has gone on with me medically, they think theyâ€™re in the twilight zone,â€ said Drottar. â€œI thought I had been exposed to asbestos. I thought I was having asbestos fibers come out of my skin. I was pulling long, thin, small hair-like fibers that were extremely sharp that could literally pierce through my finger nails,â€ Drottar said. Little information has been revealed concerning the long-term health effects of GMO crops on humans or animals, and even less information can be had regarding research correlating Morgellons with GMO foods. This is suspicious right off the bat, because it would seem that there would be a natural curiosity regarding a link between Genetically Modified Organisms that people ingest regularly and inorganic fibers that protrude from a personâ€™s skin. This would be right up a geneticistâ€™s alley, and quite worthy of intensive research. So, why arenâ€™t there a ton of published studies? Why is it so difficult finding anything related to this? Could it be that companies such as Monsanto have enough clout to effectively squash these stories? If they have enough clout to ruin countries by deceiving impoverished farmers into purchasing patented GMO seeds, and then take it a step further and force these poor people to purchase seeds year after year instead of harvesting their own, then they have enough clout to ask our more than willing corporate government to manipulate the press…again. Many peopleâ€"and most physiciansâ€"have written off Morgellons disease as either a hoax or hypochondria. But now there is evidence that this mysterious disease may be REAL and related to GENETICALLY MODIFIED food! GMO â€" Not on My Watch! The giant transnational corporations behind the GMO revolution are hitting us in our most vulnerable spot â€" our bellies. Most people have been brought up with an innate trust that what they purchase from the stores is safe to eat. This is no longer true, since most processed foods contain genetically engineered ingredients that can have disastrous effects on both animal and human health. What you purchase from the corner store might just change your DNA and create such frightening symptoms that the general public simply does not believe it. What is worse is that when you go to the doctor to get help, he/she tells you what you are experiencing is all in your head. This is rubbish! It is up to people who care to make the correlations between what we eat and what happens to our bodies. Remember the old saying â€" â€œyou are what you eat?â€ Well, this author believes it is true.